Do you have one or more missing teeth, teeth that are broken, or a tooth that just can’t be restored? A dental bridge may be the right option to help restore your smile! At Barron Family Dental in Thornton, CO, we offer extensive experience in dental restoration using dental bridges. A dental bridge is a process that creates an artificial tooth and uses it to fill a gap in the mouth from a missing tooth. The replacement tooth, called a pontic, is made from high-quality porcelain to ensure it is natural-looking and durable. Dental bridges offer increased stability in the mouth, feel like a real tooth, and are made to match the look of your natural teeth. 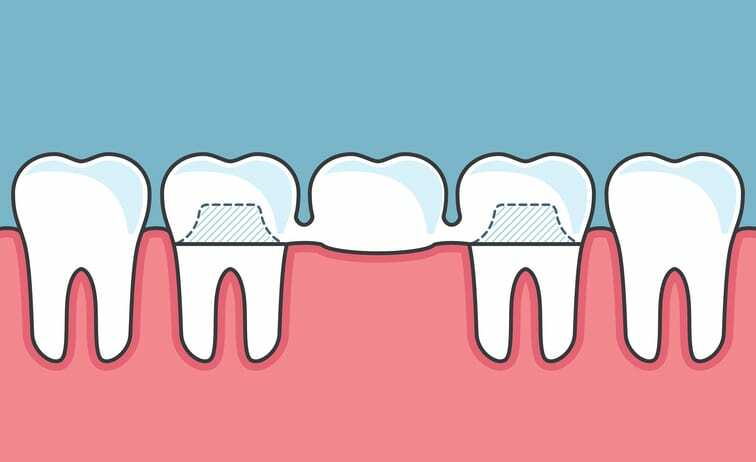 Dental bridges are typically not removable and are put in place by attaching the replacement tooth or teeth in between crowns that are placed on adjacent teeth, called abutment teeth, and used as anchors. At Barron Family Dental, you can expect a thorough examination to determine the health of surrounding bone and gums to determine the best type of dental bridge to use. Once this is determined, the abutment teeth next to the gap are prepared to accept crowns. Impressions are made of the teeth that will be used to design the bridge, pontic, and crowns. You will receive a temporary bridge while the dental bridge and teeth are being made in a dental laboratory. Once the new tooth or teeth, crowns, and dental bridge are ready, Barron Family Dental will place and permanently fixed the dental bridge. Having your smile restored will make you feel great! Dental bridges are an affordable, low-risk treatment option to help you speak and chew properly. By replacing a missing tooth or teeth, the remaining teeth will stay in position and not shift to fill the gap. Dental bridges can be kept clean with good oral hygiene habits of brushing twice each day and flossing every day. Don’t wait any longer to have those missing teeth replaced! Barron Family Dental offers expert restoration dental services to help you feel and look great in no time.